"Play FreeCell or one of three other variations on your computer"
FreeCell is so popular a game that it is even included in most Windows' default installations. The classic game is played with a standard 52-card deck randomly distributed in eight columns, with four open cells and four open foundations. The game play is kind of similar to the classic solitaire, in which you also have to put the cards in sequential order to maneuver them, but this time alternating colors. 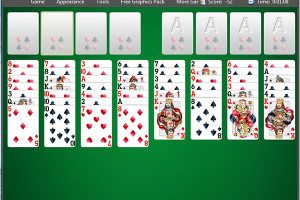 Free FreeCell Solitaire is a collection of 4 games, including the classic FreeCell and three other variations. Free FreeCell Solitaire not only includes FreeCell, but also Eight Off, Free Cell Two Decks and Stalactiles, all equally fun to play. Free FreeCell Solitaire features high quality graphics and nice animations, that combined with the relaxing game play provided by this four games will deliver hours of fun. The application also features more than enough games to make sure you never play the same one.